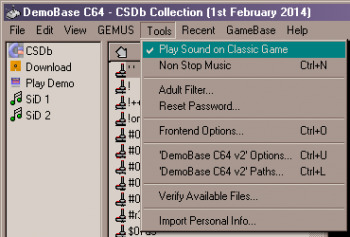 have for many years established again Gamebase64. Currently it is the V14. Insofar also runs everything, merely I have a little problem that quite annoys me. Every time I select with the mouse or cursor keys a game, sounds these Windows warning tone. Seems else to run all normal. But this warning extremely annoying. Has any anyone ever had this problem and can help me? I think the sound you are referring is not actually a warning, but the classic game sound. which only plays when a game is highly rated. I have the annoing sound warning too, but its not from the classic games, it is on ALL games.